This chapter will review the basic pharmacology of endocannabinoid receptors. As the best-described cannabinoid receptors are G-protein-coupled receptors (GPCRs), those will be the focus of this chapter. We will start with a basic review of GPCR signaling, as these concepts are critical to understanding the function of cannabinoid receptors. Next, several features of cannabinoid receptor signaling will be presented, with an emphasis on the effectors modulated by cannabinoid receptors. Finally, we will finish with a discussion of cannabinoid receptor agonists and antagonists and future directions. 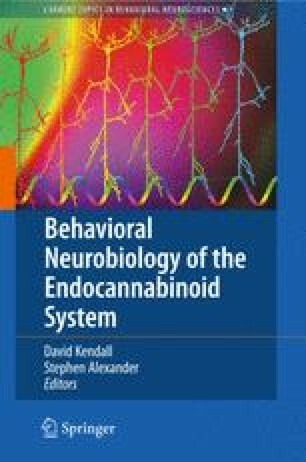 The aim of this chapter is to introduce the cannabinoid receptor pharmacology that will be necessary to appreciate the intricacies of endocannabinoid signaling presented in later chapters.